Recently there was this great thread in the Content Marketing Institute’s LinkedIn group, asking about golden rules for creating content. I came up with five points, that I’d like to share with you. There are certainly more, check the thread for some very good ideas, but these are the ones that struck me as key. Creating content without knowing who your target audience is, and what they need, is a waste of time and money. You need content that will address their problems, offer them new insights and provide relevant information. If you don’t, how are you going to get their attention, much less their business? If you don’t have a clear idea about what you want to achieve, your messaging will be fussy and unclear. This will not only confuse your target audience, more importantly it will make it more difficult for you to have a clear Call to Action in your content. And you need that, to guide your target audience to the next step, whether it’s a purchase, a download or a call. Plus, without a clear Call to Action, how will you be able to measure the effectiveness of your content? Taking the time to define a clear Tone of Voice (i.e what your brand sounds like) will help you on several levels. Your content will be more consistent, you can get closer to the target audience, and you can work with several content creators at once without losing that consistency. A lot of companies spend way too much money on content that is only used in one format and only published in one channel. You need to have a strategy that ensures that every opportunity you have for content creation results in input that can be used in several channels, and in a variety of formats. For example, interviewing a subject matter expert could provide you with text for both online and print, audio, video, data for infographics, and a presentation for an event or to post on Slideshare. Measuring for ROI is often an afterthought, arriving when it’s time to present to management. But if you integrate measurements as KPI’s (Key performance indicators) already from the start you have a much better chance of success. A couple of important things to measure are if your content actually converts (that’s why you need a Call to Action), comparisons between different channels, and also how efficient different formats are. 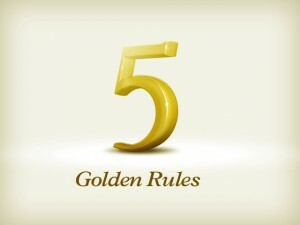 That’s my five key rules for creating great content. Did I miss anything (well, I know Ieft several things out) let me know in the comments. And be sure to check out the CMI LinkedIn group, where a lot of smart people share tips and tricks.